Using wristbands for admission verification at concerts, amusement parks, discos and hotels, as well as for patient identification in hospitals, is both practical and cost-saving. 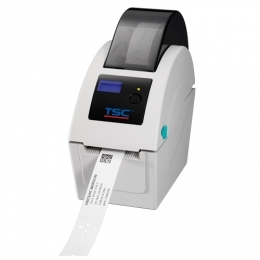 The TDP-324W Series from TSC is custom-designed to quickly print top-quality wristbands on demand. This helps to reduce patient mix-ups in hospitals, as well as to significantly reduce waiting times for admission into events and amusement parks. Housed in a compact double-walled clamshell design it contains the TSC technology you are accustomed to. As needed you can also mount the TDP-324W Series to the wall. Despite its small size it accommodates full-sized wristband rolls up to a maximum width of 16.5 cm 6.5. Simply place the roll into the centrally-located spring-loaded holder. The printer also comes standard with one USB and one Ethernet interface, to simplify connectivity into existing networks. To keep things running smoothly, the LCD display on the front keeps you informed with print job status reports. In case your computer network fails the printer can be optionally configured to continue printing in stand-alone mode. Simply call up a stored wristband printing program from within the printer, enter your information via a PC keyboard and continue to print the wristbands needed.